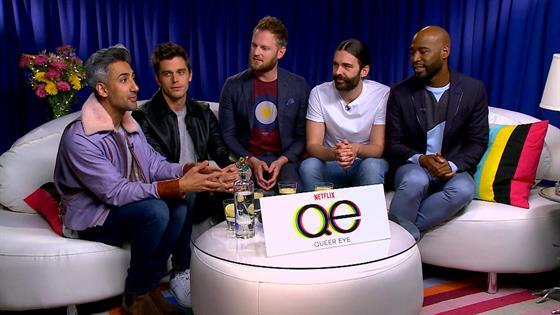 Thanks to Netflix's Queer Eye revival, the Internet has fallen deeply in love with Karamo Brown, Jonathan Van Ness, Antoni Porowski, Tan France and Bobby Berk, When Bobby cries, we cry. When Jonathan says "Yas!," we say "Henny!" When Tan smiles, we dissolve into a puddle of mush. We happily accept this as our new normal. It's hard to imagine a time when the Fab Five weren't dominating the pop culture landscape, and it's even more surprising to realize it was just last December that we all had no idea how to make guacamole before Antoni introduced it to the world. But before they were each cast as members of the Fab Five, Karamo, Jonathan, Antoni, Tan and Bobby were all successful in their own lines of expertise, whether you were aware of them or not. Chances are if you've watched MTV at all since 2004 you've probably seen Karamo before. That year, he was one of seven stranger picked to live in a house on The Real World: Philadelphia, and he was actually the first out gay black man on reality TV. He went on to compete on The Real World/Road Rules Challenge: The Inferno II (sadly, he didn't win!) and then appeared on The Next 15 in 2016, which followed six reality stars, including Tiffany Pollard (aka New York), as they navigate life after their initial brushes with fame. Prior to landing the role of Queer Eye's culture expert, Karamo, 37, hosted MTV's Are You the One spinoff, Are You The One: Second Chances. Jonathan, our grooming expert and one-liner machine, was known for his hilarious Emmy-nominated Game of Thrones recap show, Gay of Thrones, for Funny or Die, which he started doing back in 2013. In 2015, Jonathan, 31, launched his podcast Getting Curious with Jonathan Van Ness, which has over 4,000 reviews and a five star rating on iTunes. Can you believe?! Prior to his web series and podcast successes, he was a hair stylist working at successful salons in Los Angeles and New York City. The 34-year-old avocado-loving food and wine expert actually had a few acting credits to his name before becoming a member of the Fab Five, including small roles on The Blacklist and Blue Mountain State. While living the struggling actor life, he worked in restaurants. But Antoni's career pursuits shifted when he met original Queer Eye star Ted Allen, who was the Bravo iteration's food and wine expert, at a book signing, with the Chopped host hiring Antoni as his personal assistant, mentoring him along the way. Is there anyone who wouldn't trust the design expert to redo their living space? (Seriously, Bobby, 36, is a miracle worker and deserved to be treated as such.) He launched Bobby Berk Interiors + Design in 2006 after working his way up the retrial design world ladder, starting off at Bed Bath & Beyond and Restoration Hardware before becoming the Creative Director at Portico Home + Spa. Not bad for a guy who moved to New York City in 2003 with only a few dollars in his pocket. Like Bobby, the fashion expert also got his start in the retail world, working at Zara and a few other retailers after falling in love with making clothes while working at his grandparents' denim factory.